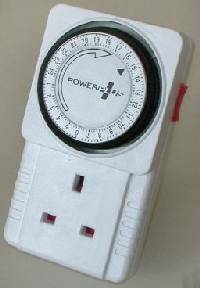 Automatic 24 hour timer switches for 240 Volt mains electricity are very easy to find and are very cheap – prices start at just 99 pence! With such a timer (see image below) it is possible to set the times a plugged in device (typically a lamp – but also fans, pumps, irrigation systems, and other appliances) will switch on and off through a 12- or 24-hour period. Unfortunately equivalent programmable timers for 12 Volt applications are not so easy to come by, and those that are available tend to be very expensive since they are not so mass produced. In this article we will introduce a couple of the better 12 Volt Timers available as well as looking into how you canmake your own timer. 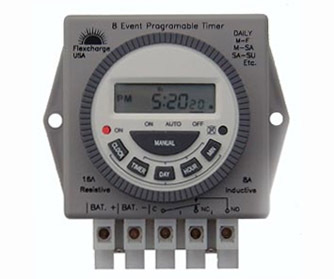 Pictured above is a digital 12 Volt programmable timer manufactured in the USA by Flexcharge. Costing around US$85, this is a 7-day timer which can be programmed with up to 8 on (and 8 off) events per 12 hour period. An internal battery is included which will stored programming data for up to 3 months without external power. Pictured above is the DT-01 Digital 12 Volt Programmable Timer – available in USA for around US$65. 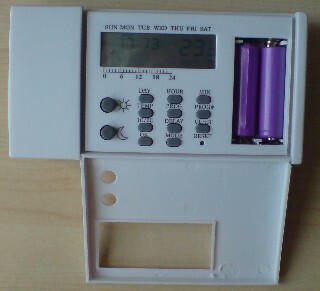 Typically used in automatic fish feeders (see super-feed.com for details), this timer provides up to 8 on and off cycles per day individually settable for the seven days of the week. The internal lithium battery will retain programmed timings for up to five years when disconnected from the main 12 Volt battery, and the incorporated relay is rated at up to 16 Amps meaning this timer can be used to switch on and off up to 200 Watts of devices. 90-124uA are drawn by the timer when it is switched off (i.e. just 90 one-millionths of an Amp), and 33-49mA (i.e. 33 one-thousands of an Amp) when the relay is energized. Click here for the DT-01 Specification Sheet. An affordable alternative to the dedicated 12 Volt timer discussed above is a programmable thermostat. These battery-powered devices can easily be converted to run from solar power, or from the battery bank of a renewable system (via a voltage regulator). These thermostats contain a built-in relay which can be used to switch 12V DC and 240V AC devices on/off according to the times programmed in by the user. Used good quality units are available for as little as £10.00, and new Chinese imports start at around the same price. 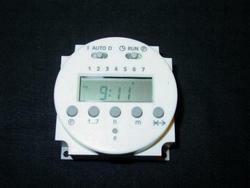 Click here to read our Use Thermostat as 12 Volt Timer article. NEW – Click here to read our new article Convert Digital Mains Timer to Low Voltage to find out how to make a cheap low voltage digital programmable timer. Since commercial 12-Volt powered timers are so expensive, it is worth investigating putting one together yourself using easy to obtain electronic components. 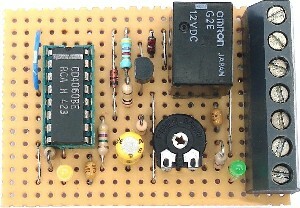 Find out how to construct your own adjustable 24 Hour Timer using a 4060B binary counter chip by clicking here.